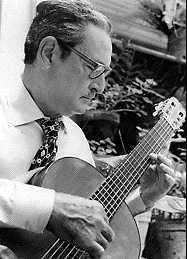 Antonio Lauro was born in Ciudad Bolivar, Venezuela on August 3th, 1917. His father emigrated to Venezuela from Italy during World War I. Lauro studied at the "Escuela de Musica y Declamación" in Caracas under Vicente Emilio Sojo and Juan Bautista Plaza. He first began playing the piano, but on hearing the Paraguayan guitar virtuoso Agustín Barrios Mangoré in concert, he decided to devote his musical study to the guitar. Lauro wrote and arranged many works, most of which are as yet unpublished. Most of them are for the guitar, but he also composed works for acappella choral group, orchestra, orchestra and choir, piano, piano and voice, organ and voice, string quartet, wind quartet and other instrumental combinations. More often than not, the inspiration for his compositions was derived from the folklore, instruments and regional dance rhythms of Venezuela. Important pieces composed by Lauro: "Natalia", "Andreina", "Tatiana", "Yacambu", "El Niño", "Nelly", "El Negrito, "La Negra", "El Marabino", "Angostura", "Carora", "Suite Venezolana", "La Catira", "Sonata para Guitarra", "Variaciones sobre una cancion infantil", "Madrugada", "Armida", "Maria Carolina" and others. Lauro died in Caracas on April 18th, 1986.